It looks as though the efforts to get commercial space taxis off the ground is succeeding. 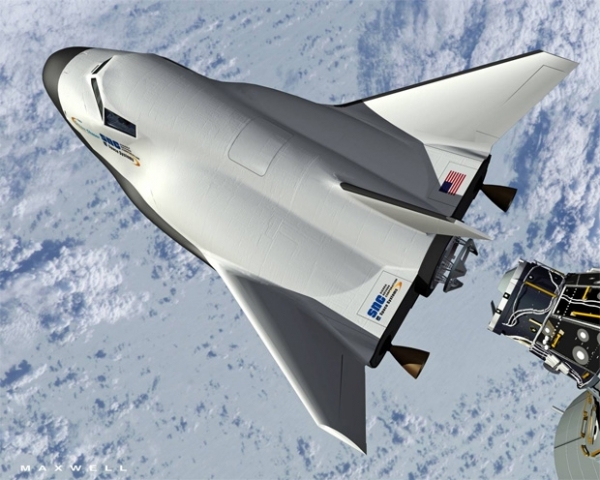 Sierra Nevada Corporation’s (SNC) “Dream Chaser” space plane is slated to conduct its first test flight as early as next summer. SNC is one of four companies that have had proposals selected by NASA under the Commercial Crew Development Program – 02 (CCDev2). The test flight, what is known as a high-altitude free-flight test or “drop-test” will see Dream Chaser lifted high into the air, where the craft will then be released from its carrier aircraft and attempt an unmanned landing. During the course of this flight test program SNC will test out the space plane’s autoland and other capabilities. With NASA’s fleet of orbiters retired and being prepared to go on display in museums, NASA is dependent on the Russian Soyuz for access to the International Space Station (ISS). NASA currently pays Russia $63 million per seat for trips to the orbiting laboratory. Many within both NewSpace and established space companies have stated their intent on reducing the amount of time that the U.S. is in such a position. NASA also has worked to assist companies that are working on CCDev2 to either meet or exceed their deadlines. NASA is hopeful that these developments will allow the space agency to turn over transportation to the ISS to commercial firms by 2016. In the case of SNC, NASA increased what the company was paid by an added $25.6 million. SNC had already been awarded $80 million as their part of the CCDev2 contract. After this boost in funding, SNC announced that the drop test would be held next summer. The Dream Chaser design is based primarily off of the HL-20 lifting body design and is capable of carrying seven astronauts to orbit. Dream Chaser is designed to launch from Cape Canaveral Air Force Station located in Florida atop a United Launch Alliance (ULA) Atlas V 402. If everything goes according to how it is currently planned, the test flight will take place at either Edwards Air Force Base, located in California or White Sands Missile Range in New Mexico. Virgin Galactic’s WhiteKnightTwo will carry the Dream Chaser space plane aloft for the test. Virgin Galactic, another NewSpace firm, is based in the U.S. and owned by Sir Richard Branson. The ISS is viewed by the U.S, and the 15 other nations involved with the project as a crucial investment and having only one way to send crew to and from the ISS as being unacceptable. Sierra Nevada’s Dream Chaser is joined by Space Exploration Technologies’ (SpaceX) Dragon spacecraft, Boeing’s CST-100 and Blue Origin’s as-yet unnamed spacecraft in the CCDev2 contract. Jason has degrees in journalism and public relations. He has covered over 30 launches as well as other space-related events – including flying with Commander Chris Ferguson as he trained for the final shuttle mission, the president’s visit to KSC and from Utah during the test of the five-segment DM-2 booster.